So dapper. 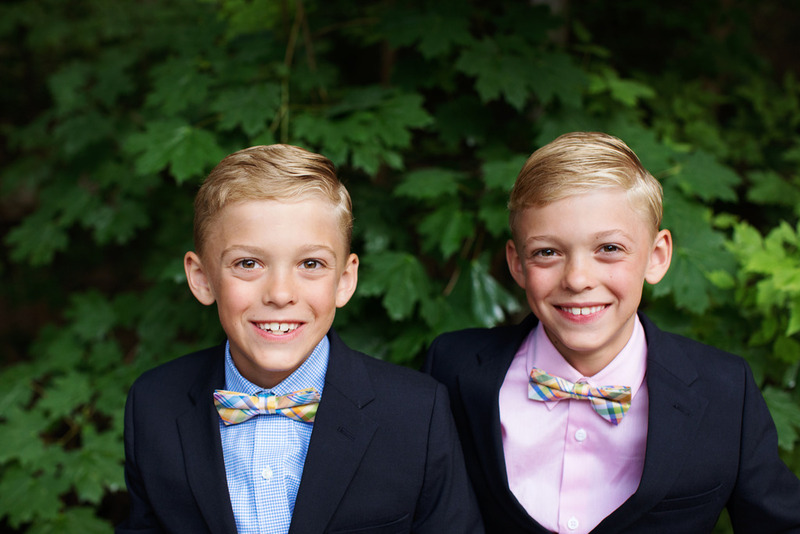 In their matching bowties. What happened to my tiny tag-along buddies with blonde curls? In what minute did they become these handsome, long-legged fellas ready to take on the world? It’s funny, ya know. Not often now do they climb tandem onto the couch next to me to snuggle. Sometimes they do, when I read aloud. And sometimes Gordy will give me the best out-of-the-blue hug. But when I see them watching cartoons together, or giggling at Calvin & Hobbes, I’m the one who likes to sidle in between them, put my arms behind their necks and pull them close. Little toads. They can get along so famously one moment. And so infamously another. One friend said to me when she saw these photos, “Seems like yesterday they were finagling a way out of their crib tents.” Ha! Oh yes, those were days. Followed by climbing out their bedroom window onto the roof, hauling down neighborhood streets on their sküts, digging up the next door flower pots, and painting our white stucco wall with muddy handprints. They’ve already filled our family annals with memorable tales. Gordon, you are sensitive to spiritual things, and to my surprise, you have a gift of being aware when heavenly beings might be with you. When you were baptized a few weeks ago, you leaned over to me during the end of the service and said, “I can tell Grandma is here.” And when you said it, I knew she was too. You make a fuss sometimes about doing things I ask, but in the end, you notice that it feels better to make the right choice, do good things, mend fences, apologize, show love. And I appreciate that so much. You are pretty darn funny, making me laugh with your awesome dance moves and impersonations. And your goodnight kisses melt me every time. And come February, I gotta agree. Spence, I love your heart. Just the other day you were helping me water the flowers out front and you got angry about something. You huffed inside, only to return about five minutes later, looking contrite and apologetic. You said you were sorry you got angry and completely changed your attitude. Said you were ready to help me finish watering the garden. I love seeing you figure these things out, with a little prompting from the heavens. You are tender, and true. You are full of sunshine and energy. And you give life everything you’ve got. The wonderful and selfless Michelle Lehnardt took these photos of the boys. Ever talented and a dear, dear friend to me, I am so grateful she was able to capture our boys, just as they are right now. At the big 8. She introduced us to Sweetaly Gelato on 15th and 15th in Salt Lake, on the way home from our photo shoot. Must stop if you are in town. They have a chocolate fountain and the best gelato in the state! So, along with turning 8 years old in the Mormon culture or religion, comes the opportunity for children to be baptized and confirmed members of the Church of Jesus Christ of Latter-day Saints. They are eligible at the age of 8 for baptism. So this is something we try to prepare our children for, and it is always a beautiful ordinance, performed in the same method as Jesus’ baptism was performed when he was baptized by immersion in the river Jordan by John the Baptist. Spencer and Gordon were baptized in this beautiful font with stained glass windows, on July 8th, by their Dad. Their Grandfathers acted as witnesses, and the viewing area was packed with children straining over the font, friends, neighbors, congregation members, and family. It is a happy day, in which all the special people in your life come to support you, and share in the joy of taking this first step on a path towards, what we believe, is returning to live with a loving Heavenly Father in Heaven. I have a new assignment in our church, and it is to help with the baptisms of all the children in our stake each month (a stake is a grouping of congregations in a geographical area). Right before the baptisms we show this video. And then this video. Of children talking about the video above. I love their interpretations. Following the baptism, the boys were confirmed members of the church and given the gift of the Holy Ghost by their grandfathers. Because each of our boys have the same middle name as their grandfathers, we thought it would be special if my Dad, Robert Keddington, confirmed Gordon Robert. And Doug’s Dad, James Arveseth, confirmed Spencer James. I can’t believe I forgot to get photos of the boys with their grandfathers! I will do that next time they’re all in suits. Ugh, what a shame! Each blessing was so unique to each boy, so perfect, so beautifully spoken, with wisdom, spirit, and great love. My Dad mentioned specifically that there were loved ones on the other side, like Gordon’s Grandma, who were watching and so pleased with all that had happened on this day. I felt that Doug’s brother, Steven, was also there. Aware, and wanting to be close to his brothers and parents. I love this framed quote my friend Lisa gave me after my Mom passed. She lost her husband years ago, as a young mom. And I know she counts us on this truth, daily. That God is not the only one cheering her on from heaven. I wore this beautiful locket and charm my friends gave me. Thank you to all of you who contributed. I love it so very much. After the service, we went back to our house for lunch. It was just after the 4th, so we had fun decorating with red, white, and blue, using flag plates and napkins, and barbecuing in the backyard. My cousin Mary brought her twins! She is amazing to watch. Much more laid back than I was during the early twin days. My Aunt Leslie, Deb, Sarah. Always lots of willing hands to hold babies! Sweet baby Jack and my sister, Sarah. I cannot get over those crystal blue eyes. The Schrofs. That’s what we call our Shroepfers. Dearest friends over so many years. My sister Rachel, and her Emma, with cousin Ada. Becca, my Dad, and my uncle Rog. Lance and Neil, ganging up on Bec. Doug’s parents, Jim and Renae. Our next door neighbors and dear friends from the old house, Jay and Marilyn. Christian. With all the crazy I didn’t manage to get the rest of Kara’s family in a photo! Cousin Ryan and his new wife, Jessica. And beautiful Jane, the kids’ tennis coach, who couldn’t make the service because she was teaching class, but came over afterwards to eat with the kids and dole out hugs. She is honestly one of the greatest humans I know. So kind, so encouraging. A complete builder. I don’t think my kids would get up at 7AM to hit the court with very many people. But they will do it for Jane! And that’s a wrap. The big 8. In a big, long post. But even this isn’t long enough to hold all the love we’ve felt lately from friends, family, and heaven. To the moon and back boys. I love you!